Dr. Kendrick can place and restore dental implants at Midwest Dental Center! When a patient comes to our office and asks for help to replace a missing tooth, our restorative dentistry team is willing to help in any way that we can! Dr. Kendrick is experienced with caring for the needs of his Midwest City patients. After a preliminary examination, we may suggest a dental implant — a popular, permanent tooth replacement method. To learn if you qualify for the dental implant procedure, please call Midwest Dental Center today to schedule your appointment. A dental implant is a tiny, titanium screw which acts as an artificial tooth root. After the implant is placed, the jaw bone will fuse with the implant over time. This can make a solid, stable foundation in which to anchor a dental crown. When a dental implant has successfully fused with the jaw, Dr. Kendrick can create and customize a natural-looking crown to match your smile. This final step in the dental implant procedure is the dental implant restoration. Dr. Kendrick can use CEREC one-visit crown technology to measure and fit your mouth for a unique dental crown. While the dental implant takes the place of a tooth’s root, the dental crown restores the look of the actual tooth. Your fully restored dental implant can help you look and feel as if you never lost a tooth to begin with. Why is it important to replace a tooth with a dental implant? When you lose a tooth, the other pearly whites along your gum line will drift out of proper position, altering your bite and causing alignment issues. And once a tooth is lost, the nerves in the empty socket will send a signal to your jaw bone, alerting it to the missing tooth. The jaw bone may then begin deteriorating because there is no longer a structure to support. A dental implant may provide a reason for your jaw to remain firm and strong. This is why it’s important to see Dr. Kendrick and the Midwest Dental Center immediately after you suffer an accident that results in tooth loss. The longer you wait to schedule a dental implant consultation, the more time your bone has to decay! If you’re nervous about going to the dentist, that’s okay — Dr. Kendrick has sedation dentistry available for dental implant patients who may need a little help relaxing. Just ask our staff about it when you call our office. 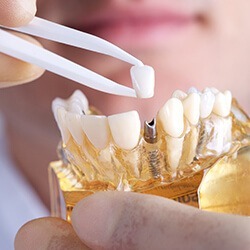 There is no doubt that dental implants in Midwest City offer eligible patients the best solution for missing teeth, and this high quality does come at a higher price. The total cost of your implant procedure will depend on a few factors, including how many teeth you need to have replaced and how healthy your jaw bone is. Before your consultation, take some time to learn more about the cost of dental implants -- and how we can help you make them more affordable. Dr. Kendrick sees dental implant patients from Midwest City, Del City, Oklahoma City, and nearby neighborhoods. Please contact us today to schedule your dental implant appointment at Midwest Dental Center.